After the last raid, council workmen spent several days loading tons of broken glass from the roads onto lorries so that the roads could be used without the risk of punctures. A few fires which had been put out remained hot enough to break out again, and any that started to burn again were dealt with by the Fire Service. The emergency feeding arrangements continued for several days after the last raid, while damage to gas, water and electrical services were being repaired. Meanwhile, most houses had broken windows and many had fallen ceilings. Those living in all such houses found that they not only had to clear up the initial glass and plaster, but until windows and doors could be sealed again, cleaning up the dust was an almost endless task. No sooner had the thick layer of dust been cleaned up when the wind blew more in through any unsealed opening. One major problem caused by damaged water and gas mains was the inability to wash clothing or bedding to clean off the dust and soot spread by the bombing. 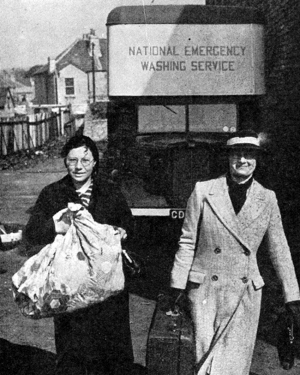 Emergency laundry facilities were brought in to help those who could not do their washing at home. During the following days and nights involved the Rescue Squads searching the wrecked buildings, the Medical Services treating those who had been injured, and the Mortuary Service attempting to identify the dead. At first, the Rescue Squads searched the buildings where they had been informed that there was somebody trapped alive, then the buildings which were badly damaged but which could have held survivors, either because they were known to have sturdy cellars, or the building had some part of its structure still standing. Finally, when all hope of finding living survivors had faded, the grim task of clearing rubble in case it concealed dead bodies began. Remains of the dead were still being uncovered several weeks after the last bombing raid. Whenever the Rescue Squads found somebody alive but badly injured, the hospitals, already overcrowded from the immediate aftermath of the bombing, had more patients to admit and treat. To make matters worse, the Royal United Hospital, although relatively lightly damaged, had windows and blackout materials destroyed, which meant that electricity could not be used to light it at night. For two weeks after the bombing, the hospital had no gas supply and all cooking was done on paraffin stoves. Initially, there was no water coming through the mains either, and the Army (actually the Leicestershire Yeomanry) brought mobile water tanks to the site, and the local fire service provided pumps to transfer this water to the hospital buildings. Help arrived to treat the patients. An emergency surgical team came from Bristol. The Royal Air Force provided staff from the Field Ambulance Service. The War Office released some beds from the Military Hospital in East Block, which had been commandeered at the beginning of the war. Somehow, the hospital coped, which is quite remarkable considering that this was before the National Health Service, and the Royal United Hospital was funded entirely by charitable donations. The Mortuary Service was not finding identification easy. After the first night's raids, some of the dead had been moved to the temporary mortuary in the crypt of St James Church in Southgate. These bodies had been identified by documents, or by the address where they had been found, and each had a hand written label attached which gave the identity if it was known. On the second night, incendiaries set fire to St James Church, and it became a major fire. The fire brigade managed to put it out, but used lots of water to do so, and much of the water flooded the crypt. Not only did this water make the crypt unusable as a mortuary, so that the bodies had to be moved somewhere else, but it also washed the ink off the identification labels, so that nobody knew who they were. In addition, some of the dead were so badly damaged by bombs or fires that they were unrecognisable. Identification in some cases was achieved by having clothing or jewellery identified by those who were reporting friends or relatives missing. As each was identified, a Death Certificate was issued. 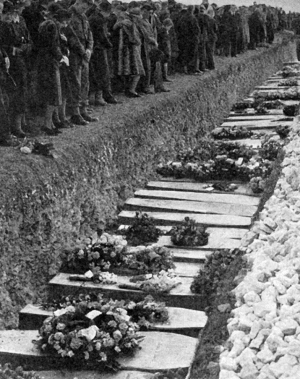 On 1st May 1942, a mass funeral took place, when 247 bodies were buried in a Communal Grave (see picture). After that, smaller services were held as and when needed. Those alive and uninjured but with their homes damaged, had to have somewhere to live. Some travelled to stay with relatives, but for many this was not an option because their work kept them in Bath, or they had nowhere to go. In the short term, they could be accommodated in church, village or school halls in villages around Bath, but first aid repairs to damaged houses was made a priority so that as many as possible could return to their own homes. A team of two thousand workmen in the first few days, later grew to nearly three thousand. Their task was to patch up buildings that were damaged but not dangerous, boarding up shattered windows, removing loose chimneys and making damaged roofs waterproof so that they could be used again as homes or shops. Meanwhile, the City Engineer's Department of Bath Council conducted a street by street survey of all the damaged buildings, and produced a report listing them all by category and degree of damage. The aim was to identify the houses, shops and businesses that could be reasonably easily made usable again, so that people could return to their homes, safe in the knowledge that the building would not collapse. Another aim was to identify the buildings that were so badly damaged that unless they were safely demolished, there was a risk that they might fall down and injure passers-by. These lists gave the emergency repair crews a list of buildings to patch up, and the demolition crews a list of buildings to pull down. The lists have been combined and resequenced, and are reproduced in the Locations section.